Outplayed for much of the first set, Murray was forced to bounce back from a set down and also saved a set point in the second before earning himself a spot in his third Grand Slam final with a forehand half-volley winner after three hours and 46 minutes. "You are probably not going to believe this but I actually thought it was 4-3, I didn't know until the umpire called five all at the end of the game," said Murray. "So that probably helped me ... It happens occasionally but not in a match like this. I was so focused, I was pretty wrapped up in it and lost track. I hope it doesn't happen again." "He's an unbelievable athlete, unbelievable competitor, it was an unbelievably tough match and I managed to come through but he's such a tough player to play against. "I don't think everyone gave (Ferrer) the respect he deserved after he beat Nadal but I certainly did. In the second set I started to go for my shots a bit more and it paid off bit it was a tough semi-final." Pummelled in straight sets by Roger Federer in last year's final, Murray will better fancy his chances against third seed Novak Djokovic despite the Serb producing a scintillating performance to beat the Swiss defending champion in the first semi-final. 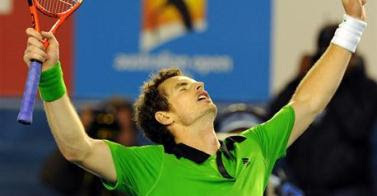 He's obviously playing great tennis," Murray said of world number three and 2008 champion Djokovic. "He's been there before, we both have." The 23-year-old fifth seed, who will look to become Britain's first major singles champion in 75 years in Sunday's match, was also beaten in straight sets by Federer in his only other Grand Slam final appearance, the 2008 US Open. Both players made a solid start to the match but it was Ferrer, clearly still on a high from beating compatriot and world number one Rafael Nadal in his quarter-final two days ago, who looked happier to settle in for the long-haul as he charged around the baseline. Perhaps surprisingly then it was Murray who drew first blood when he broke in the seventh game, after consecutive errors from the Spaniard off the forehand wing. But the seventh seed, playing in just his second Grand Slam semi-final, immediately got back on level terms with a backhand volley winner across court. Dropping his serve seemed to unsettle Murray as went on to produce a poor service display just two games later to hand Ferrer the first set, stepping inside the baseline and slapping a backhand long. Murray looked to set things right in the first game of the second set as he broke when Ferrer sent a forehand long. But once again the Scot could not make his advantage tell, promptly dropping his serve with a slack backhand into the net. The match could have had a completely different complexion had Ferrer taken the second set and the Spaniard will no doubt be ruing his missed chances after he let a set point slip in the ninth game, a forehand return ending up in the net before Murray went on to hold. The two players again traded breaks of serve at the end of the second set, Ferrer dropping serve with a routine backhand into the net only to break straight back and force the tie-break. But any hope Ferrer had of pressing home his advantage in the breaker were roundly dismissed by Murray as he earned himself six set points with his third ace of the day before going on to wrap it up three points later when the Spaniard hit long. The third set was much more straightforward as Murray broke in the fourth and sixth games before surviving multiple break back points and taking a two-sets-to-one lead when Ferrer again missed with a forehand down the line. Things looked as good as over for the clearly tired Spaniard when Murray broke in the opening game of the fourth set. But the world number seven displayed an impressive fighting spirit as he bounced back, albeit with a little help from Murray to keep the pressure on. A small slip at the net obviously unsettled Murray as he jarred his back and a double fault followed by a backhand long and a forehand into the net handed Ferrer the break back to love. Neither man blinked as the fourth set inched towards the inevitable tie-break, both holding serve four further times without facing a break point. But when it came down to the breaker, Murray showed nerves of steel as he stepped things up a level to produce another scintillating display - racing out to a 5-1 lead at the change of ends with a 209kph ace out wide. And just two points later, the Scot sealed his place opposite Djokovic in Sunday's final with a stretched forehand half-volley winner into the open court after he had pulled Ferrer wide out of position with a forehand drop shot. "I think I wasn't mentally tough," was Ferrer's rater harsh verdict. "Lot of rallies and had set point in the second set but in important moments he served very well."